Beside that Big OB plan which got zero insterest, I'm thinking of building a bass module with cardioid characteristic into that system instead of dipole. My main thinking is to get better directivity control, reduce reflections and room modes, and higher output. A is well-known NaO which is a semi open back U frame. B is a combination of monopole and dipole. There'd be cancellation on the back. At the first glance, C seems to be a waste of drivers because 2 of them work in a way almost identical to 1 in dipole configuration. The AXYS system emphansizes DSP. Does this do anything good to that "waste" mentioned above? It's Finnish, but one can have a look at the concepts and the response graphs. In a small room, i.e. not an auditorium, there is very little to be gained from a directional bass source. SO basically all of the configurations that you showed are simply ways to expend more money with no net gain. In a large venue there is some reason for directional bass, but the configurations that you show above would not work very well. 1) is not going to work because the delay of the front from the rear is not great enough to do anything - it will be a dipole. 2) will have trouble because the outputs of the two sources won't track each other (monpole versus dipole) and so without some complex EQ this won't work very well. 3) may work to some extent, but again probably not very well without some signal processing. The best is a forward facing driver or two and a rear facing one like 3) above, but with some signal processing control on the rear facing driver. This can be made to work quite well and has been sold by JBL in the past. 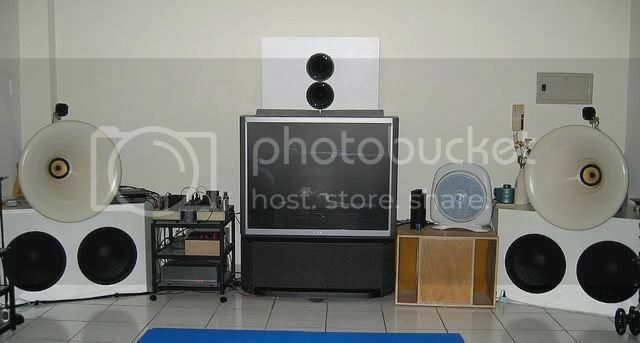 The benefits of cardioid or quasi-cardioid response in a listening room have been addressed by Backman, (AES paper 5867, 2003). Cardioid bass and monopole bass both are capable of taking advantage of room pressurization below the room fundamental where as a dipole woofer does not. Whether you view that as a positive or negative depends on what you are trying to accomplish. However, all dipole and cardioid sources have fundamentally a 1st order gradient response with reduction in efficiency of 6dB/octave, compared to a monopole, as the frequency drops and must be equalized for flat response. Again, whether this requirement is viewed as a draw back depends on how it is weighted against the other design factors. The conventional way to produce a cardioid response is through two monopole sources separated by some distance, d, operating out of phase with the input of one source delayed by Td = d/c where c is the speed of sound. This delay can be introduced through any means available over the frequency range required. A digital delay can be used for a pure time delay. A suitable analog all pass delay can also be used but yields a constant delay of a limited frequency range. Rather than using two separate monopole sources, which add to expense, a single source mounted in an open backed enclosure can be used. In such a case, without going in to detail, the cavity of the rear enclosure must be damped. This helps damp the cavity resonance and also forms an acoustic low pass filter. The damping must be "tuned" so that the combined effects of resonance damping and low pass filtering yield the correct delay relative to the front to back length of the cavity. If the length is again d, then the damping must be adjusted so that the cavity delay at the rear exit plane is Td = d/c. When correctly tuned the opened backed system, AKA an acoustic resistance box (Holmes, AES, 1986), will tend to a cardioid at low frequency. Only when undamped it will tend to a dipole. The damped cavity is the NaO woofer as shown in A. Figures B and C are similar to each other in operation. In both cases they result in a dipole summed to a monopole. In both cases the dipole (consisting of one front driver and the rear driver in figure C) must be equalized to have the same on axis response as the monopole driver. Additionally, to form a cardioid the acoustic centers of the monopole and dipole components must be correctly aligned. 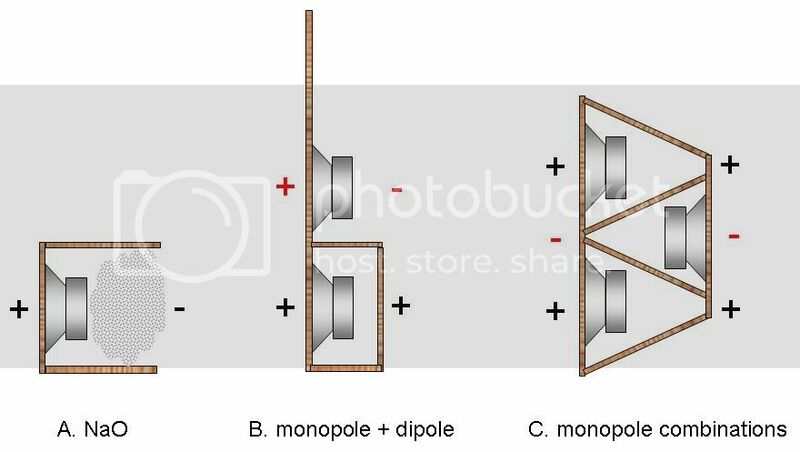 Further more, since the sensitivity of the dipole and monopole as well as the on axis response must be matched, it is likely that the dipole and monopole components of configurations B and C will require separate amplifiers. While it is possible to obtain a cardioid response over a wider frequency range with configurations B and C (since there is no cavity resonance) the additional cost of the added drivers makes them less attractive than configuration A. If additional drivers are to be used it would be better to use them as in A to increase the SPL capability of the system. Thanks a lot for all your replies All are helpful. First of all, I'd like to say actually I've heard different kinds of good basses, i.e., sealed, vented, horn, OB(dipole).... etc. So I do believe many solutions can lead to excellent sound quality. The bass cabs were fixed into the corners. Later, I moved to another apartment with a much smaller living room. I thought to myself, this space is not gonna take it. So I built dipole bass this time. The big OB still overloads the relative small room, but much smoother and much less boomy overall. gedlee, I've learned a lot from your kind posts. I should say thank you for that. I've also read somewhere else that you don't think dipole bass is a good idea. However this conflicts my own experiences. Beside the example above, I've also heard other good dipole basses. So, maybe these are not all that scientific and come with so many variables, but they still impressed me by their clear and smooth sound. Now this system (bass module) is not going to be home use. The target space is about 7~8m wide x 25m deep with very high ceiling, up to about 15~20 seats. And high sound quality is the main goal. I got more confidence with dipole bass in reagard of the sound quality, but also worry it may not have enough energy to fill the bigger than average room. So, cardioid comes to mind. Now it seems cardioid response is not easy to get right The complexity seem unavoidable in the settings and integrations. Anyway, I'll give it a try and see how it works. Will update for progress in the future. This statement made me laugh so hard I almost died. Rather than using two separate monopole sources, which add to expense, a single source mounted in an open backed enclosure can be used. In such a case, without going in to detail, the cavity of the rear enclosure must be damped. This helps damp the cavity resonance and also forms an acoustic low pass filter. The damping must be "tuned" so that the combined effects of resonance damping and low pass filtering yield the correct delay relative to the front to back length of the cavity. If the length is again d, then the damping must be adjusted so that the cavity delay at the rear exit plane is Td = d/c. When correctly tuned the opened backed system, AKA an acoustic resistance box (Holmes, AES, 1986), will tend to a cardioid at low frequency. This exactly the way MEG does it in their reference monitor series (with the suffix K for "Kardioid"). MEG was the then supplier of broadcast and studio monitors in the former GDR. Their speakers have a very good reputation and are known for precise and almost fullrange even directivity and contantly also gain a following among HiFi-Enthusiasts now. All systems are "almost" coax. Interesting detail is that the mid driver is also acoustically laid out as a cardioid in order to make the coax work properly, wrt directivity. "However this conflicts my own experiences." I've been reading a few posts where people are saying that monopole bass/dipole mids is the way to do it, but my experience is telling me that it's the other way around. I'm never gonna make it as an audiophile. It depends on what your goals are. Cardioid bass is the least sensitive to room/listener placement. But form a uniformity of total radiated power it can be argued tha dipole mids with monopole bass is the more desirable way to go.